The word made fleshless, ripp’d at toothèd breath. In bloodless blood and crown of baphometh. Son of the Morning, rise again! Inspired by the traditional strong golden ales of Belgium. The lure of this distinct style lies in the benign & golden appearance when poured into the glass. The enticing profile of sweet malt and spice leaves the palate entranced and forgetting the 10% alc that comes along with this devilishly delightful crafted ale! Pleasantly sweet and rich taste, with caramel notes. 10% alcohol hidden behind taste very well. This is an awesome beer, deceivingly normal appearance hides a deep and satisfying experience. Compared to Tripel Karmeliet, it's a much less bitter version but as tasty! 10% abv, N/A ibu, 650ml bottle. A - clear golden (orange) with one finger white head, not really lingering lacing. S - malt, bubblegum, banana, pineapple, toffee, candy, butter, yeasty, tart. syrup, floral, earthy, peppery spice. T - moderate carbonation, smooth, sticky honey mouthful. pineapple bubblegum. grassy hoppy, refreshing. sweet, fruity like juice. malty as it warms up. sweetness lingering tongue. O - delicious strong beer! alcohol is really really well hidden, yet u can feel the heat. 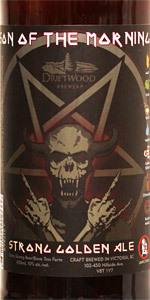 another great special release from driftwood, of course the label design, and the satan ingredient. worth to try. L: Pale yellow with a high amount of carbination flowing up the glass. Has a nice white head that leaves small amount of lacing down the glass and a slight white head that seems to stay for most of the beer. S: Kinda sweet with a slight coriander smell to it as well. T: Fairly sweet with a nice amount of malt to it has a little coriander taste to it. Has a slight bitterness to it as well. F: Almost to high of an amount of carbination to it. It has a strange taste to it. Well, this one is a swing and a miss for me. Nothing really works here and the over amped alcohol really gets in the way. I am glad I shared the bottle at a tasting with two other guys. It came across to me like a very inelegant La Fin du Monde - no offence to Unibroue. This is the first beer by Driftwood I didn't like. And I've had pretty much all of them. Appearance: Pours a slightly clear-hazy amber like the morning sun (pun totally intended). Tops off with a generous bubbly white head that dissipates a fairly quickly but leaves behind a good surface of foam and a great ring with good lacing. Aromatics: Full of fresh bread and yeast, I get a few scents of mellow non-sour lemon citrus, some apricot, and fresh grass that borders on pine. All these scents inter-mingle with one another and all seem to appear simultaneously. I also detected an ever so subtle hint of medicine at the very end (or my nose was playing tricks on me). Feel: A fairly good middleweight contender; it doesn’t try to over do itself. Somewhat sticky, almost juice-like texture. Gentle carbonation remains active so it is not overly smooth but its snap and crackle are very refreshing yet warming (like the morning son). And it’s finish is nice and dry with just a little of the hops bitterness left behind, next to none of the booziness. Overall: It hides it’s 10% ABV really really well. Loved it. The new label design (2015 version) is wickedly cool which is why I bought it in the first place. Because it is a fairly good ABV and that ABV is very well hidden I can easily see picking this one up as a regular. As for my pairing suggestion on this one - I’m at a loss, but I think a good plate of nachos (too much cheese will amplify the bread flavours) so the cheese should be thinly placed and baked crisp, and has to have ample jalapenos and/or a medium to hot salsa (with a little sour cream on the side) this will probably balance out the bready-ness and play off the spicy undertones. Not a fan of Canadian brewed Belgian pales, but this ones fantastic. Very clean with the typical Belgiany flavours. Could definitely compete with some of Belgium's top strong pales. Driftwood Son of the Morning pours a bright deep gold with a fluffy head. The aroma is sweet and fruity with tons of esters and a bit of coriander. Lots of sweet fruity malt with an almost overwhelming vegital coriander flavor. Some nice phenolics yeast flavor in the finish but overall I think the coriander is a bit overpowering. Bright gold; flowers, rubber bands + earth with a touch of clove; lagery grain, more phenols, pear, tart lemon, oil + some herb, rubber + papaya end. Clean, if a bit high on the phenols. As a Duvel clone, missing the grace. But decent. 650ml bottle, with another of those strange, splashy, and new black metal album-esque labels, that make it very hard to discern the name - no biggie. This beer pours a clear, bright pale golden yellow colour, with a teeming tower of puffy, finely foamy, and somewhat creamy off-white head, which leaves some chunky and sudsy splattered lace around the glass as it slowly sinks away. It smells of edgy, and slightly phenolic Belgian yeast, gritty pale and wheat malt, white pepper and semi-sweet coriander spice, a twinge of earthy and floral bitterness, and yes, a hearty sense of the booze not yet revealed. The taste is bready and doughy pale malt, a lesser wheaty graininess, now kind of muddled earthy spice, ethereal field honey, a suggestion of over-attenuated apple cider, and more sidling, but not quite yet alighting metallic alcohol astringency. The carbonation is fairly active in its roundabout and slightly probing frothiness, the body an adequate medium weight, and not particularly smooth, as per the style, IMHO - that typically heightened ABV hard to reign in as such. It finishes off-dry, the sweetness of the inherent mutt-ish malt, put-upon fruitiness, and simmering booziness all attesting to the fact. At times, I'm not altogether sure of any tangible differences between Tripels and BSPAs - there's the plain and grainy malt, the understated light fruitiness, some perhaps pushy spice, and uber alles, a threatening, if not always egregious alcohol stripe. All of that seems to run amok here, but in a typically restrained Canadian manner, so, um, good, I guess.